This photo intrigues me . . . 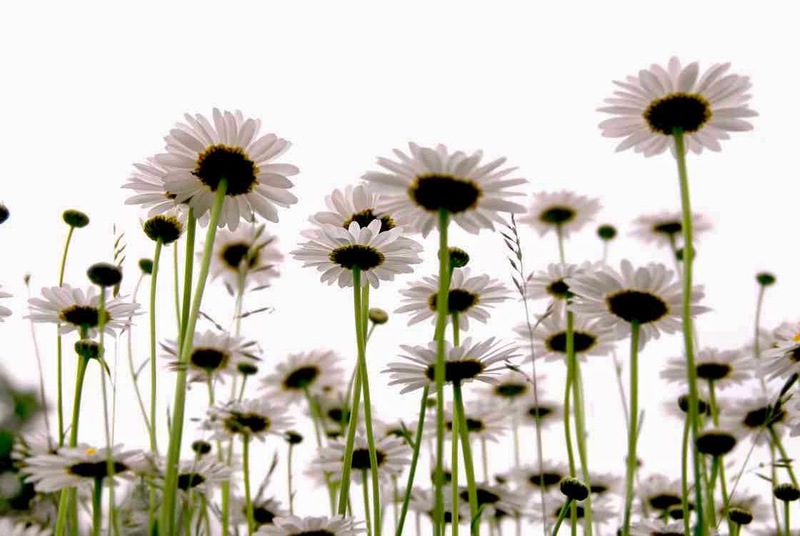 I love daises, they are one of my favorite flowers—sunshine captured and encased by delicate white petals standing bold atop strong green stems. They just make me happy because they look happy and full of joy. I have always looked at these beautiful flowers from the top and never from beneath. But now, after seeing this photo, I can see they still look happy and joyful. I like the thought of that . . . of not only being happy and joyful on the surface, but beneath as well. Having just returned from a wonderful writers conference where God did more in my life than I could have ever imagined, I have a long to-do list before me. But here is where I will begin, on my blog branding myself as a happy, joyful person—not only from the surface but from below. It's what's beneath the surface that counts. We can always put on the outside what we want others to see but it's what's beneath, flowing from our hearts, that defines who we are. It's not always easy to be joyful because as we go through life we encounter trials, disappointments, hurts, grief, and hardships. I know, I've had my share. I can't control these things, but I can control how they affect me. I choose for the joy, that comes from the Lord whom I serve, to be my strength (Neh. 8:10). What lies beneath your surface? I hope it's unspeakable joy. Joy in the good times and joy in the bad times. It may not come naturally and I understand, but it's something we CAN have because it's one of the fruits of the spirit (Gal. 5:22). The Bible says we have not because we ask not. Need joy today? Stop and ask God, for He will not only give you joy, He will give you His joy. Now . . . THAT makes me happy! Love this application, Beth. Thanks for sharing it! It wasn't always joy, but it is now. And I think that joy is even better because I know what it was like to be without it. it is what lies beneath that counts; when God lives within, the joy shines out. I love that photo too...makes you think! I like the photo too Celeste. It has mind going in many different directions. And you do know what it's like to be without joy. So glad for the miracle God did in your life! Love this! For me, what lies beneath is the power to choose what's right, to choose joy, regardless of circumstances and outward factors. Truly glad I had the chance to meet you this past week. Yes, Kathi, we do have the power to choose. So glad to meet you also. Hope to see you again in the future. Keep in touch!